Within the context of the Climate Change Adaptation Program (PACC), a number of scientific investigations on water resources, natural disasters and perceptions by local people highlight adaptation needs in the regions of Cusco and Apurímac in Peru, considering past, present-day and future climate conditions. 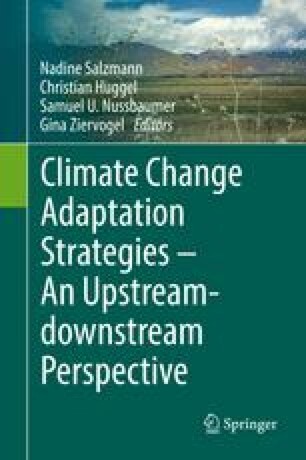 This chapter compiles their findings and attempts a systematic evaluation with respect to their contributions to climate change adaptation. The studies consistently find aggravating water scarcity during the dry season (April to September) due to projected precipitation decreases and reduced storage capacity of shrinking glaciers. Impacts include below-capacity hydropower generation and increased crop failure risks. For natural disasters, database inconsistencies prevent a detection of trends. While the natural science studies have produced a new and more comprehensive understanding of the target regions, their implications for society have hardly been investigated anthropologically. One of the few social science studies emphasizes that climate change is only one out of many determinants of rural livelihoods in the target regions, which have not been addressed scientifically yet. We thereby find an imbalance of available scientific knowledge regarding natural vs. social sciences. Overcoming such imbalance would allow for a more comprehensive integration of scientific findings into design and implementation of adaptation measures within the local context. The Climate Change Adaptation Program (Programa de Adaptación al Cambio Climático, PACC) is funded by the Swiss Agency for Development and Cooperation (SDC) through the Global Program Climate Change. The authors acknowledge the work from the practice and science sides of PACC, on which this chapter is based. The practice side is led by the Swiss-Peruvian NGO HELVETAS Swiss Intercooperation together with its Peruvian partners Libélula and PREDES. The science side is supported by a Consortium of Swiss scientific institutions, including the universities of Zurich, Fribourg and Geneva, Meteodat, Agroscope and the Swiss Federal Institute for Forest, Snow and Landscape Research (WSL), in close collaboration with universities in Cusco (UNSAAC) and Apurímac (UNAMBA). Urrutia, R., & Vuille, M. (2009). Climate change projections for the tropical Andes using a regional climate model: Temperature and precipitation simulations for the end of the 21st century. Journal of Geophysical Research-Atmospheres 114 (January). doi: 10.1029/2008jd011021.